Multi-unit properties are difficult to maintain at the best of times but having clogged dryer vents can only make things worse. 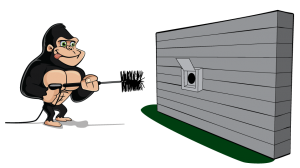 Even the most convenient appliances come with certain setbacks, but calling in a Gorilla can make your Timmins dryer vent cleaning a breeze. Professional services get a complete clean of your vents, eliminate risks and keep your system running. Clogged pipes are never a good idea. Whether they are indoors or outside, buildup on pipes, vents or ducts can lead to some serious trouble. In the case of your dryer, accumulated lint or debris can restrict the functionality of your appliance, as well as creating health hazards. It might seem harmless, but a blocked dryer vent can be one of the most dangerous parts of your property. Lint is a flammable material, so having it lining the inside of a duct can only mean a fire hazard. As air passages become clogged, there is also the risk of carbon monoxide poisoning and allergens attributed to mould. This is all bad enough in the best case scenario but certain multi-unit properties, like retirement or assisted living homes are at even greater risk. Keep your tenants safe and dryers running with a little help from your friendly neighbourhood Gorillas. Calling in a professional service for your Timmins dryer vent cleaning means expert results and service. The trick to proper maintenance for any property is proper assessment. A routine service call is treated differently than one in which service has been put off over a long period. By checking up on the severity of your blockages, our Gorillas know exactly what is in store for them. Once our maintenance experts are acquainted with your system, it is time to go to work. Our Gorillas make sure to remove clogs from every area of your system and use visual aids to make sure of it. Cameras are not only used as a means to clear away debris properly, but are used to show clients the difference that a Timmins dryer vent cleaning can make.